If you are missing one tooth or multiple teeth in a row, Dental Solutions of Clinton may recommend a dental bridge to restore your smile. 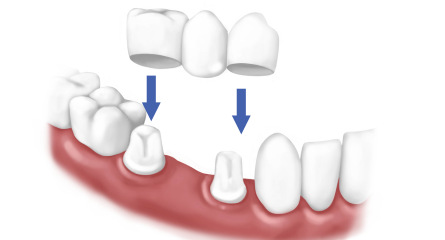 A bridge is a fixed dental restoration, meaning it is non-removable. The dental bridge is anchored in place through the use of two dental crowns, which are custom made to fit your smile and are placed on the teeth or dental implants next to the space left by the missing tooth. These crowns hold the artificial tooth in place to restore your smile, ensuring that your restoration will not easily shift or come loose. It typically requires only two visits to our practice to complete the dental bridge. Dental bridges are designed to last for many years and to restore the function, beauty, and health of your smile. To learn more about dental bridges or to schedule an appointment, please call (601) 925-5163 or send us an email.